Visco2, 3 LB, high performance 2.0" memory foam is a new technological open cell formulation. 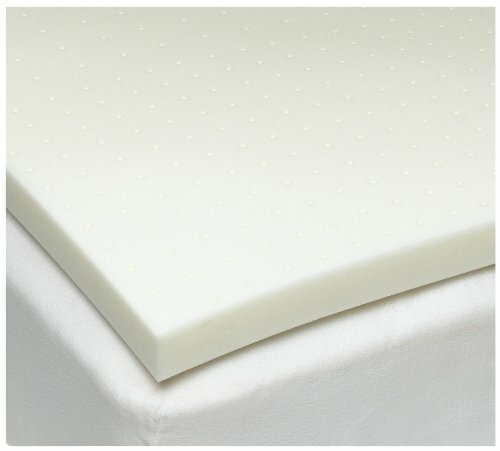 It is a ventilated breathable VE memory foam so there is no more overheating at night. Additionally with this foam there is no more shrinkage from compression or having to wait for the product to expand to its original size. Visco2 has 5 times greater airflow and heat dissipation than traditional memory foam. It allows for a cooler, more comfortable sleeping temperature and more oxygen (O2) under the covers for a healthier, fresher sleeping enviroment. The exclusive ventilation allows for increased air circulation for a more comforteable sleeping temperature and greater support in the torso areas. The open cell Visco2 returns to its original size out of the box for immediate use and does not have the permanent shrinkage from compressions as does traditional memory foam. Ultra fresh anti microbial/anti bacterial treatment included. Very comfortable, but a bit smaller than expected (I got the twin - suitable for one person). My foam wasn't really cut very straight (did they do this by hand rather than by machine???). The $300 original retail price for this product is ridiculous - its just a piece of foam. I suspect the high original price is just there to make the $60 price look like a big bargain - though I bet they make a fat profit margin from this lower price anyway. This foam topper is 8 pounds out of the box which puts the density at 3 pounds per cubic food. This is the way one measures the quality of foam toppers. The previous one that I bought from eBay (and am in the process of returning) was a cheap 1.5 pounds per cubic foot which is on the low end. To find the density, multiply the dimensions (e.g. 30x72x2 and divide by 12, 3 times) and then divide the weight by this number. 8 pounds in this case. The high end is around 5 pounds per cubic foot. You will find that sleeping on foams of different densities feels rough;y the same. The difference is in how long they last, the higher the density, the longer they will last. I bought this item when it was on sale and I couldn't be happier. I only needed the twin size, but the King was actually cheaper, so I bought the King and cut it into 2 twins. It's just a big comfy chunk of foam, so it was no problem to cut in half. The memory foam is so comfortable... my only worry is that when I go to college everyone is going to want to sleep in my bed because normal dorm mattresses just don't compare.